Awhile back I volunteered to try and cause a steel reproduction of a Tannenberg gonne barrel to fail. The original Tannenberg gonne was made of cast bronze, and currently resides in the Historical Museum Nuremberg, Germany. Found in 1849, during an archeological excavation, at the bottom of a water well at the Tannenberg castle, in Germany, which was destroyed in 1399. 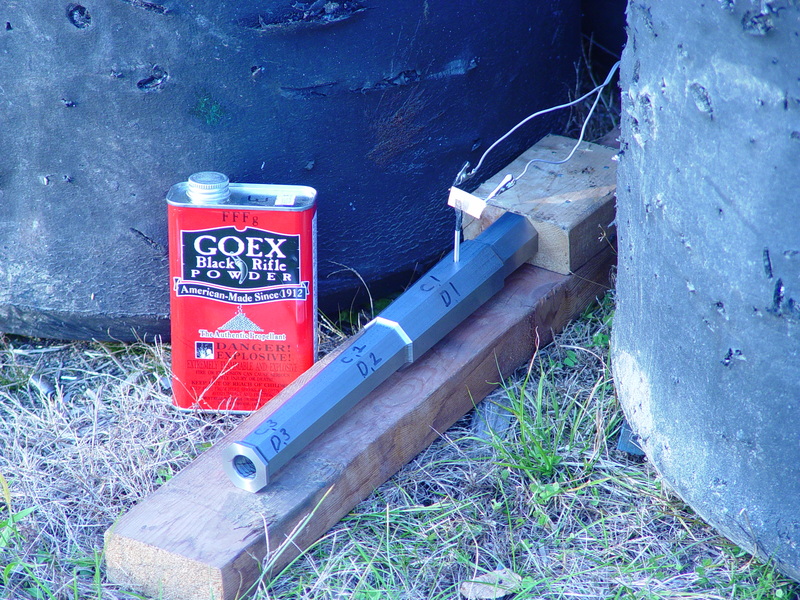 Also it is important to note is that the original had a bore of appoximately 17mm in diameter or .65 caliber. It was found loaded with a lead ball and not with an springel, cannon arrow. I took measurements at what I felt were the three most critical points where I felt failure may occur, if there was to be a barrel rupture. 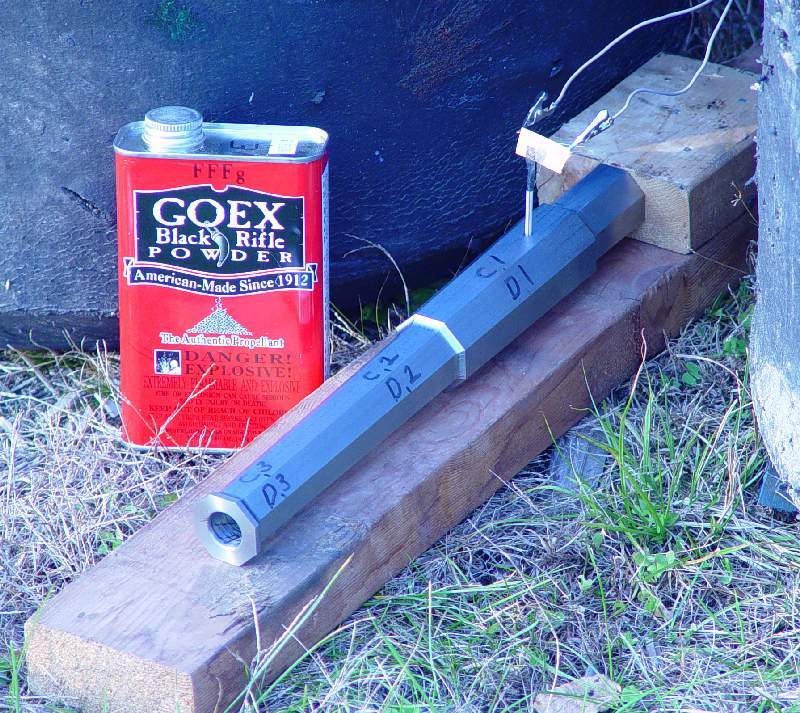 The gonne was acclimated to the test enviroment and allowed to cool after each shot. There was a decent breeze and the temperature was in the high 40's fahrenheit. I didn't want to measure heat expansion, and a true sign of failure would be a devivation from the original measurements at the original temperature. Any metal when exposed to heat is going to stretch. That's a given. However, the point of failure is not always herald by a bulge in the metal. Stress fatigue in harden metals is discovered by means of x-ray or magnaflux. What may past casual measurement and visual inspection may still fail due to the metal crystalizing. 12L14 has give in its Molecular structure, and why I favor it so. If you look closely at photos of gonne between the numbers you can see a black spot that I use to determine where to take my measurements. 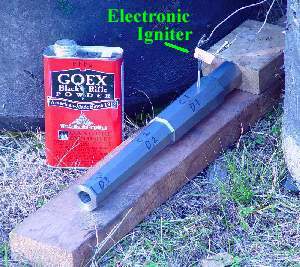 Ignition was acheived by means of an Estes rocket igniter and a squib. 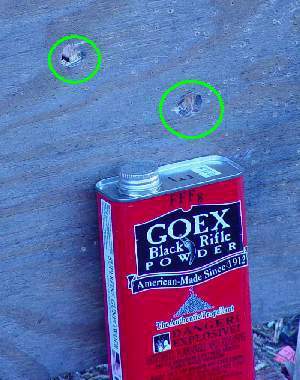 In my video clips you can see how the smaller charges had more recoil and smoke discharge as opposed to the first charge of 120 grains and a single patch ball. I feel that medieval gonne makers anticipated such pressures, hence the sub caliber powder chamber. 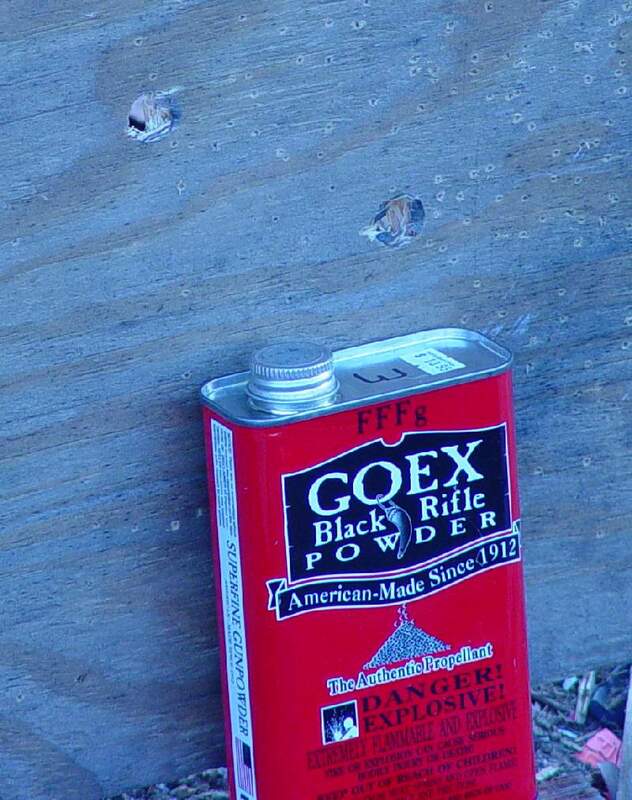 Modern commercially made blackpowder is glazed and not porous like homemade or powder of medieval times. 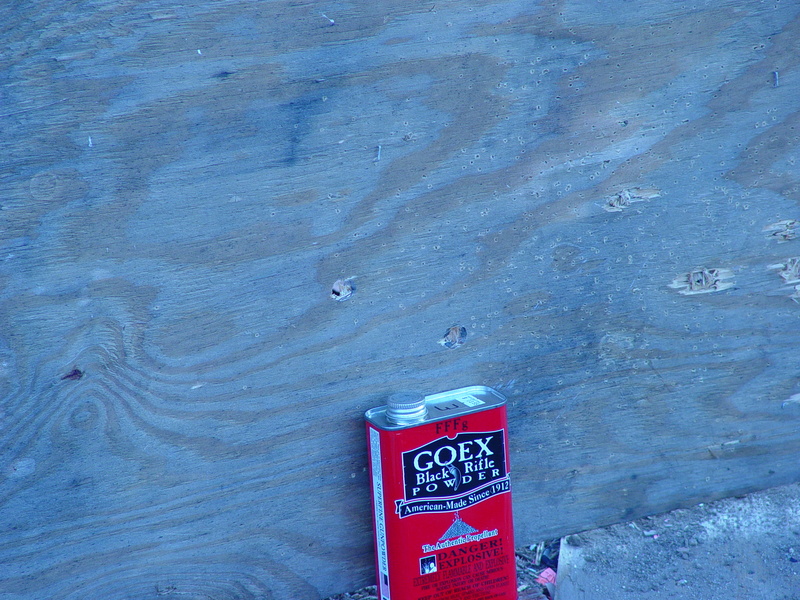 The glaze, while protecting the powder from the moisture of enviromental humidity, actually retards the powder's rate of ignition when compacted. However, when powder is loose, the rate of burn is multiplied and higher pressures are achieved. Overall, no ill effect occured or was discovered from testing. Its my feeling that the Tannenberg gonne was designed so that it would not blow up. I don't know who here is fimilar with Ulrich Bretscher's research, pay attention to his findings under the heading: The secret of the peculiar powder chambers. Also, when you watch the movie of the different discharges, take note of the differences in recoil. Discharges are 120 grains FFFFg , single patched ball, 80 grains FFFFg 2 patched balls, 60 grains FFFFg, 3 patched balls. The smallest charge had the most recoil. I feel the reinforced subcaliber powder chamber was design so to take advantage of the dynamics of powder "detonation", also known as "flashover" in cartridge guns. Tannenberg prepared for firing, ignition by means of squib and Estes rocket igniter. Holes in 1/4" plywood from double ball, 80 grain charge. Holes in 1/4" plywood from triple ball, 60 grain charge. On the last discharge, there were 3 balls, the powder 120 grain powder chamber was only half full. That's a 60 grains charge with 3 patched balls. The balls were so tight I actually hammered them in to start them. I thought that between the effects of detonation and the blocked bore something had to give. It didn't. The Tannenberg spat out all three balls in a fairly nice group, as you can see above.The holes circled in green shows where the three balls penetrated the 1/4 inch plywood. Distance to the target was 15 yards. Holes in backstop from triple ball, 60 grain charge. In this photo, you can see where two of the balls enter the backstop, another 3 yards behind the plywood target.